YouTube for business can be a great marketing channel. Advertising on YouTube is tricky so here are some video ideas for small business owners. In my post the other day, I talked about YouTube Video Marketing – Are You Trying To Go Viral? In that post we talked about the fact that, while it is important to try and “go viral”, most BUSINESS videos are going to rank okay only within a niche. This post is about getting your business videos to laser target a niche that may get you fewer views but those views will be laser targeted! So in this post I was thinking that I would target the keywords “youtube for small business” which is good for my main site keywords. BUT I wanted to rank well on google for the correct search term so I used the Google External Keyword Tool to do a search and see if there was any traffic for those keywords. Come to find out, the search term that I was thinking of had 170 searches per month BUT the search term YouTube for Business has 368,000 searches per month. This was a pretty easy one to figure out – the post HAD to be titled “YouTube For Business Video Ideas – Advertising On YouTube”. So I have a general idea that the Google itself should like “YouTube for Business”, but what does YouTube think about that? I used the search bar and found that there were 623,000 without the quotes (a pretty hard nut to crack), but there are only 113 results for the exact search phrase WITH the quotes. I can fight 113 people!!!! So next I will make a video that matches this post that will include a link back here. I will also share that video with my social media buddies which will increase likes, views and offer me credibility. All this is great, you say. All this figuring out what to make is good, you say. BUT what the heck should you make videos of?!?! There are some REALLY easy ways to figure out what to make videos of for your industry without having to figure ANYTHING out! What do you find to be the most interesting bits of your business? If you are a florist and have come up with some really neat tricks to arrange flowers, make a video of that. What do you find the most annoying about your business? I frequently make videos of things that I am sick of explaining over and over again. If you are a dog groomer, make a video of each of the different grooming styles starting with a fluffy, hairy mess and turn them into a show dog! FAQs – I guarantee that you have questions that come up over and over, make a video of each answer. Take this right off of your website! Check your emails – I always have my clients send me long answers they give their clients for blog posts, do this same thing for your videos. If you are a realtor and get lots of questions about a specific subdivision or town, make some videos of that area. The great thing is that you can send the video with your email description and let them see a bit of your personality with your answer! So those are the easy ones. 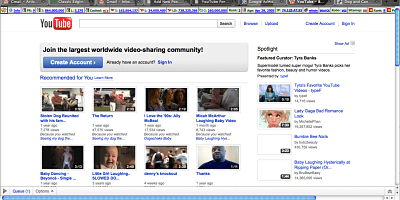 Now lets go to YouTube and do some searches to see if we can figure out some good topics with not too much competition! I was doing a search for a client for the term “dog pain” because he sells a great natural dog pain product. What I noticed was that when I did that search, there were a lot of videos about yoga and a man called T-Pain, AND there were 30,800 results. So I redid the search with negatives included, so the search looks like dog pain -T- -yoga, which means search for dog pain but ignore yoga and T- before pain. Now we only have 7,410 results but that is still a lot of competition. I have done some research online and know that dog pain medicine is good on regular Google so I checked on YouTube and there are only 722 results PLUS that is the actual product that he sells so SCORE. We need to do some dog pain videos for him! So does advertising on YouTube work? YouTube is much like Facebook. People are not necessarily going to be willing to watch a true advertisement. What you want to do with YouTube for business videos is make a video that is going to be interesting or informative, NOT saley. I have to say that we have found that most small business owners earnestly make videos that are truly advertisements and not informational. If you are going to actually try and sell something, make sure that you have a video that would be interesting to someone other than your Mom and THEN include a link back to a sales page or or at least a post with a call to action to buy something. So there you have it, great YouTube for business video ideas! I hope that come up with some good, informative, videos that you would be proud to share. I would do SOME $100 videos and then a TON of smaller free videos with a flip camera. It is impossible to tell which videos are going to catch on in the marketplace but I will tell you will always be a WIIFT (what’s in it for them) kind that will be interesting. It sounds like you are on the right track – let us know when you have your channel up so we can take a peek!! !